Lone Mountain Audio » ATC at AXPONA 2018! 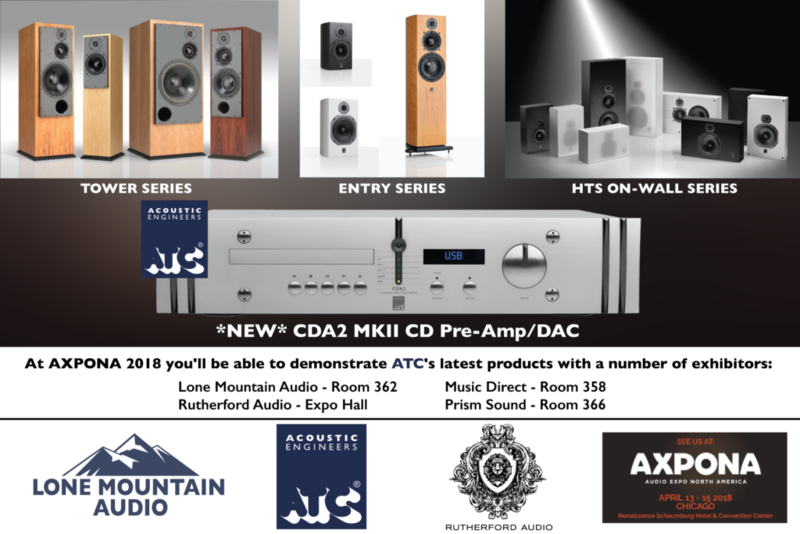 Las Vegas, NV (April 4, 2018) – At AXPONA 2018 you’ll be able to experience ATC’s newest products in a number of exhibitors rooms; Lone Mountain Audio – Room 362, Music Direct – Room 358, Prism Sound – Room 366, and Rutherford Audio in the Expo Hall at The Renaissance Schaumberg Hotel & Convention Center on April 13-15, 2018. The brand new CDA2 MkII CD Pre-amp/DAC will be making its USA show debut! ATC, Acoustic Transducer Company, is a British manufacturer of loudspeaker drive units, complete sound reproduction systems, and electronic equipment. ATC achieves levels of performance far exceeding the industry norm through the use of in-house designs and manufacturing, versus reliance on OEM manufacturers and parts. This “ground up” approach allows ATC to push the boundaries of what is possible and to achieve nonpareil performance. ATC’s award-winning Consumer Hi-Fi loudspeakers are the best choice for music and theater in the home. Learn why the best recording studios and artists worldwide choose ATC’s. ATC Loudspeakers are distributed in the U.S. by Lone Mountain Audio and represented by Rutherford Audio. We invite you to demonstrate ATC Loudspeakers at AXPONA to experience ATC’s immersive and purity of sound firsthand. You’ll be truly amazed at what you’ve been missing in the music you already own.